* These items may or may not contain soy; the source if seldom listed on a food label. So if you have soy allergies or a soy intolerance, it is imperative that you read labels on foods carefully and ask specifically about the food you are ordering in a restaurant if you’re eating out. For many people, creating all or most of your food at home is the best way to ensure you are avoiding all soy products. Are Soy Products really the answer for people with milk allergies or lactose intolerance? If you can’t eat dairy products, it may seem like soy products such as soy milk, soy cheese, soy yogurt, soy ice cream, even “butter” made from soy oil are great alternatives to use. Unfortunately, non-fermented soy foods are not the “health food” they have been advertised to be. 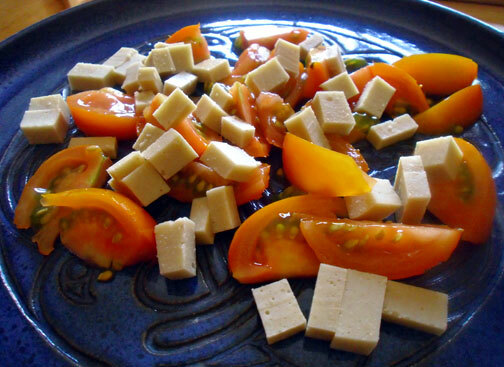 Fermented foods such as tempeh, fermented soy sauce, miso and natto are generally okay to eat in balance if they are organic and if you don’t have a soy allergy or soy intolerance. However, most non-fermented soy products on the market are made from GMO soy and many have added MSG. Read more about why it’s important to avoid soy products. So what can you eat on a soy-free diet? When you realize that many of the foods you have been eating are made with soy, it can take some time to figure out exactly what you can eat instead! Mayonnaise: Almost all mayos are made from soy oil. You can find soy-free mayo in some grocery stores in the natural foods section and at most health food stores. However, most are made from canola or safflower oils and unfortunately these oils are also usually genetically modified. Salad dressing is another food product where soy oil is hanging out on a regular basis. Read lables when buying salad dressing or make your own. Making a simple vinegarette takes me about 5 minutes to make in my nifty salad dressing bottle. Soy flour: Soy flour is added to many breads that you buy in the store. It is also sometimes used in gluten-free baking. However, I highly recommend using other gluten-free blends for baking and avoiding bread with soy flour in it. Again, this is for the same reason that people should avoid non-fermented soy products. “In addition, soy contains a high omega-3 content that quickly goes rancid when the bean is made into flour. Soy flour has a disagreeable taste that is difficult to mask – nature’s way of telling us to avoid it. The phytoestrogens in soy have been promoted as panaceas but they are actually goitrogens that depress thyroid function.” Nourishing Traditions, by Sally Fallon, page 477. Soy nuts: Eat any other kind of nuts besides soy nuts if you can tolerate them. All nuts have enzyme inhibitors in them so it is best to soak raw nuts overnight (add 1 Tbsp salt to water), drain them, then dehydrate them in the oven at 150 degrees for 12-24 hour. Soy sauce substitute: I originally wrote this post in 2009 when a soy-free soy sauce alternative did not exist on the market. A lot has changed since then and you can now get coconut aminos at most health food stores. They are an awesome replacement for regular soy sauce as long as you are not allergic to coconut. Steps: Combine all in a saucepan and boil until reduced to 1 cup. Bouillon cubes: Buy or make your own veggie, chicken, fish, beef or lamb broth. Bouillon cubes usually contain soy and hydrogenated oils that are harmful to your health. Luckily most boxed broths are soy-free and you can now find bone broth pretty easily as long as you are willing to pay extra for it. I like Imagine Foods Chicken broth because it is sugar, soy and gluten-free. More soy-free broth: Here is a great compilation of allergy-free broth and bouillons. Miso substitute: There are misos that are soy-free and made with chickpeas. You can also use 1/2 – 1 tsp salt to 1 Tbsp miso in recipes calling for miso. This works for dairy-free cheese recipes. For recipes calling for miso for a soup base, use organic chicken or beef broth. Soy and Vegetable oil: Vegetable oil is another name for soy oil. Soy oil is used to fry many foods in fast food restaurants and sometimes in regular restaurants. It is also in almost all frozen dinners, many breads, cereals, salad dressings, etc. Although it does not have soy protein in it and therefore may not create an allergic reaction, it is a GMO-laden oil that is very harmful to our health. Cook your own food at home with extra virgin coconut oil or cold pressed virgin olive oil. Avoid all products with soy or vegetable oil in them if you can. If you are at a restaurant, always ask what kind of oil was used to cook the food even if you may feel like you’re being picky. Soy-based Baby Formula: Breast milk is best but if you are unable to breastfeed for whatever reason, the best nutritious baby formula I have found is this recipe at Weston A. Price Foundation. Tofu and TVP: If you’re a vegetarian or can’t eat meat or seafood for what ever reason, eat properly soaked and cooked beans and lentils, nuts and seeds for protein. Hemp protein powder is a good source of protein. Butter substitutes: unless you are allergic to dairy or avoiding casein, I recommend eating organic butter from grass-fed cows. If you can’t eat butter, you can make or buy ghee. Ghee has absolutely no milk protein in it and is suitable for a casein-free diet. I personally love using extra virgin coconut oil or coconut butter as butter substitutes. They taste great on toast and in cereal. For cooking and baking, you can use extra virgin coconut oil or cold pressed virgin olive oil. Milk: Raw milk or raw milk kefir is best unless you can’t drink milk. Raw goat milk products including goat milk, goat yogurt and goat kefir are easier to digest than cow’s milk products but still contain some casien. If you can’t eat raw milk or goat’s milk, try making your own almond milk. Some packaged almond milk still has soy lecithin in it. You can also make nut milk out of about any kind of nut and it is much healthier for you than buying storebought nut milks. Hemp milk is also good for you and is high in Omegas. My favorite dairy-free and soy-free milk is coconut milk. I not only use it in hot cereal, but in many different types of recipes that call for milk. Find brands that are not sweetened or have added water or thickeners in them. Also, buy whole, full fat coconut milk and organic if possible. Daiya cheese is a good alternative and is free of all the 8 common allergans, however it is more processed than eating whole foods. Did I forget anything? Let me know if you have further suggestions for a soy-free diet! I’d love to hear from you! I can’t wait to try that soy sauce alternative. How cool is that? I would have KILLED for it when I was nursing my little guy as an infant. He was soy and milk intolerant, so I couldn’t have soy sauce at all which made for not-quite-as-tasty stirfries. Me too! I couldn’t have eggs, dairy, soy, spicy foods, onions, garlic, gas-forming veggies like broccoli. It was very hard! What I would like to know ,if someone is lactose intolerance, are they intolerance to Soy also? do they go hand in hand with each other? I get the same Symptoms when I have Soy as I do when I have Milk. I have been lactose intolerance from a very young age. and notice now that when I started to eat Soy, I get the same symptoms. I drink lactose free Milk, and I am just fine , no problems with my stomach etc….. I am not sure if I can say they go hand in hand – but I would say that many people who have food allergies and who are allergic to dairy or lactose intolerant also have problems with soy. Or, if a person ends up eating a lot of soy to substitute for the dairy, this can lead to an allergy just by eating too much of it. But it all depends on the person and everyone is different. The best thing is to get tested by a doctor. I like using chiropractors to test for food allergies. Good luck to you! I had dairy protein intolerance 10 years shown by extended exclusion diets and re-challenges, then last couple of years realised was probably Soy PROTEIN as well. (Protein intolerance is different to lactose intolerance). My medical literature searches (I have background in Drug Research) show many researchers are now grouping dairy protein and soy protein intolerances together as Soy protein appears to be very similar and can cross react in about 5% of milk protein intolerant people. If you drink lactose free COWS milk you may not have a protein intolerance to dairy. Remember that protein intolerance reactions can be delayed for hours & up to four days from ingestion. (These are different from dangerous allergy IgE reactions). You might consider exploring soy protein allergy. It seems that soy oils and lecithin are OK for most people with soy protein intolerance. It is a slow process and keep an open mind for other causes of gastric upsets. I would ask your Dr. but in general I am not an advocate of most soy products because unless it is organic, it will be GMO. Also, if it is not fermented, it is also not good to eat very much of it because it can cause digestive problems. So if you do eat it, I would stick to fermented soy such as tamari, miso and tempeh. Good luck!